When the moosh first switched over from a crib she’d fall out of bed, then run into the wall trying to find her way back into bed. It was very funny to hear from downstairs. We then installed a ramp of pillows so she’s simply roll out of bed instead of fall out of bed. I highly suggest this. There are two types of sleepy kids in this world, those that fall asleep anywhere and those that will only fall asleep in (or somewhat nearby) their bed. I have the latter. If you are a parent to a child who only falls asleep in their bed, many pictures must be taken of the child when they are asleep anywhere but their bed because this phenomenon is much like spotting the Loch Ness Monster or a full toilet paper roll if you’re married. 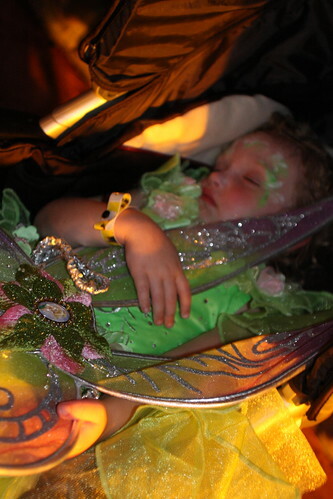 A child will weigh an additional ten times its age in pounds when asleep. For example, a 30 lb. three year old will weigh 60 lbs. when sleeping. (3 years x 10 addl. pounds per year +30 lbs. =60 lbs.) Multiply by two if you have to hold said child for any amount of time over ten minutes. Nothing can cure an exasperated mother’s heart better than seeing her child asleep. It gives one the belief that, yes, you can do this again tomorrow and that kids, at some point, do hold still and shoosh. 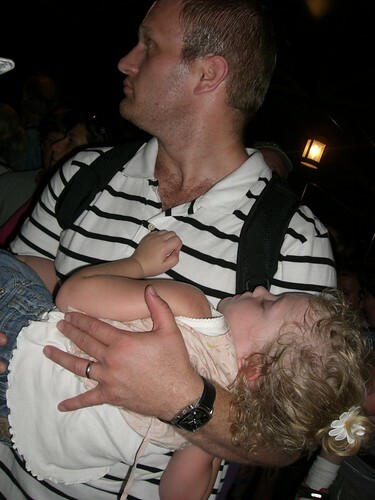 I remember I had to hold Jordan for three hours one evening and my arms ached the rest of the night. It was awful! But he was also my sweet little Jordan at the time so I ate up every minute of holding his chubby cuteness. Too bad he won’t even let me touch him now. Oh! 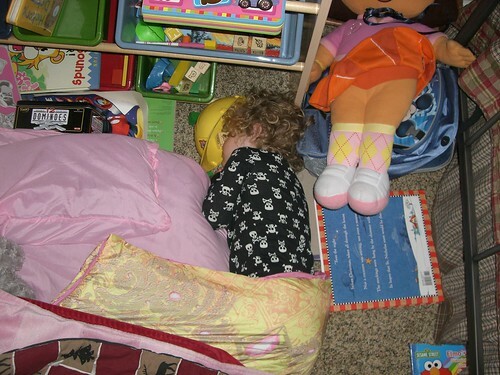 And is it just me, or is it only children who can stay asleep while sleeping on top of a hard hat? Wonderful pictures. I esp. love the fairy picture. OK, first things first: VERY cute photos. Love the skull and crossbones jammies. My daughter is like the Moosh (“mush”? “mewsh”?) and will only sleep in her bed, unless we’re doing a long road trip, where she will sleep in her car seat. 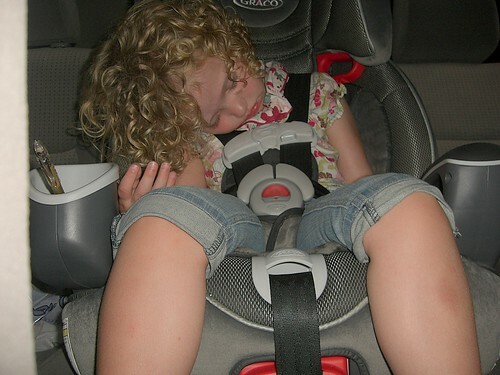 (Actually, come to think of it, she’ll sleep in her car seat on our way home from the mall…) But yeah, when she does crash and I have to carry her? Damn, she’s heavy. fabulous pictures. my girls are with the moosh – only sleep in their cribs. 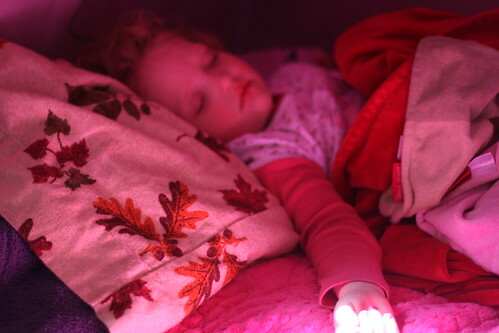 As this is wonderful MOST OF THE TIME, it can be hard when the schedule is off – and we too find ourselves snapping pictures when they sleep elsewhere. And yes, they do become like a big ole’ sack of potatoes! My kids will fall asleep anywhere. Anywhere BUT their beds. Just this morning I woke up with one on my legs, one beside the bed, and one between me and the hubby. Lucky me! this is too funny and too true! my son also only sleeps in his own crib, and we also take a picture EVERY TIME he sleeps somewhere else. Erin Gs last blog post..Don’t Touch the Tree! alis last blog post..oh, Sean Avery. alternate title…Mommy, what’s sloppy seconds?!? I adore sleeping kid pictures. One of mine can sleep anywhere, anytime, just like her dad. The other two will only sleep in their beds, with the required blankets, animals and pillows. And can you pull Dora’s skirt down in that first photo? I feel the need to cover her up. I actually have a ramp of pillows next to MY bed… but it’s for the skunk to climb UP. That math you show for having to hold them is so right on! And my baby weighed 30 pounds at 12 months. We are SO in trouble with him. Love this series of sleeping pics. Need to do something like this. Also, is your daughter the next Shirley Temple or what. What amazing hair. Love that pic in the 2nd post. Sooooo cute! I understand that completely! When I look over and see the baby taking a nap, I’m like “YES”, I can finally go onto the computer and look at blogs again! Its great to get a break. WMs last blog post..Oh mah gawd, my morning was so awesome. Are you trying to tell us something? Are you pregnant? I love your math equations. You’re going for the Nobel Math Prize with those theories, aren’t you?! My girl child falls out of her bed every night. And she is 10. Those are sweet pictures. Why does my kid look like Sloth from the Goonies when he’s asleep and you have a little angel???? Not fair, photographically speaking. This is currently the story of my life. You are so right about The Sleeping Child curing our hearts. 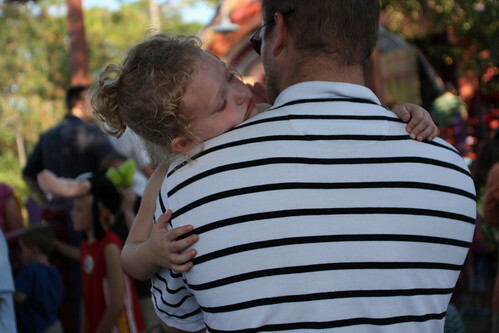 Somehow it acts as a ‘reset’ button and all the whining and fussing and stress of the day just melts away. Magic, how they do that. You just about made me tear up with this one. I still adore watching my kids sleep even at 11 & 9 years. And I TOTALLY agree with your weight theory. If a scientist disagrees then I will allow you to test said theory on my special needs son. These are adorable pictures! I only have expereince holding sleeping children in nursery… but I would have to agree! Cute pictures! I wish my kids slept often enough for me to get pictures of them sleeping. Right this second we are fighting with our middle child to stay in his own bed. i love a girl that can sleep anywhere! my girls are all like that…we are always on the move! Having a non-sleeper, whether in a bed or elsewhere, it TOTALLY the best birth control ever. cute pictures…my daughters only sleep in bed (or on my lap)…but I too have got a few sleeping pictures to black mail them with when they get older…haha!!!! Barbara Bakers last blog post..A sweepstake based on votes!!! My two year old refuses to sleep in his own bed. He will fall asleep just about anywhere, but if you try to move him into his bed he wakes right up. And if you try to make him go to bed in his own room he throws a fit like the world is ending. Also, his body temperature doubles when he sleeps. I do wish I had one of these kids that will a) sleep anywhere and b) sleep. I’m looking forward to experiencing the sleeping child math someday! You have such a precious girl! There is nothing better than that sweet, angelic, sleeping face. And then they wake up screaming. Nothing better than a sleeping child. Except maybe a sleeping child in skull & crossbones pajamas. Those are awesome. Nothing is better than a sleeping child. Except maybe the sleeping child’s chubby feet. You’re dead on with the baby brothers!